In 1994, the Adult Justice Center was designed to provide a safer community. With the onset of new State Regulations, the existing County Jail and the surrounding community detention centers were unable to meet the minimum requirements. It is not only designed to State Requirements, but also to ensure a safe working environment for the corrections officers. The specific building materials that were chosen are to create a long term, maintenance free complex. The use of the latest Security Automation technology and the implementation of the new Policy and Procedures manual will allow Trumbull County to effectively utilize all functions of the Trumbull County Adult Justice Center. Along with new technology must come education, advanced computer training involving all aspects of the new facility "systems" and intensive "hands on" training on all of the advanced systems that have been integrated into the facility will always be a top priority. The facility took many years of planning. With the combined efforts of Trumbull County Sheriff Thomas Altiere, Trumbull County Jail Administrators, and other countless individuals, it is a dream come true. The integrity, foresight, and determination of Sheriff Altiere and the Trumbull County Commissioners to bring twenty-first century technology to the Trumbull County community remained unyielding through every phase of the project. The Trumbull County Adult Justice Center is equipped with the latest computer technology. Inmates incarcerated in the new facility will be monitored in several ways. Computerized identification wrist bands with bar codes will be used to scan accurate inmate information for positive identification at all times. The bar codes on the wrist bands, once scanned, will not only provide instant inmate information, but will confirm participation in any of the programs that will be adopted at the new Adult Justice Center. There are over 129 video surveillance cameras strategically placed around the outside and throughout the inside of the facility. These will be used to constantly monitor the outside fenced-in perimeter of the facility, as well as monitor all inmate traffic when moving inside the perimeter of the jail. 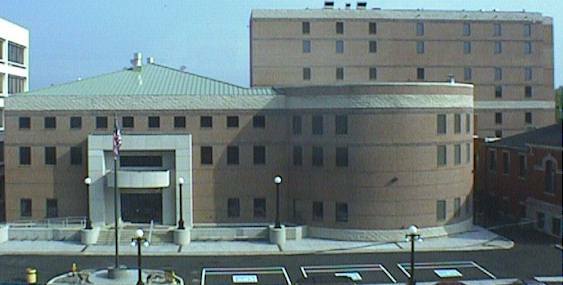 The Justice Center is a twenty-four hour facility that in addition to administration and administrative assistants, employs six assistant wardens and sixty-four well trained, state certified corrections officers. The design phase of the project started in January 1994. There were 17 prime contractors involved and over 25 sub-contractors. The entire building is 180,000 square feet. Concrete used equaled 1650 yards. 310,000 linear feet of Rebar was used. 165,000 blocks built the building frame. There are over 345,000 bricks. 4 miles of video cable. Over 6240 linear feet of plumbing. The Minimum Security Jail will house up to 96 non-violent, misdemeanor, first time offenders as well as non-violent F4 and F5 felons. This concept in the Adult detention facilities is relatively new being developed in 1991. It consists of a dormitory-type environment that will support many of the "Work Release" inmates. The "Work Release" program is another giant step forward in allowing the incarcerated individuals to continue support of their families, reduce fines and costs, and maintain an element of dignity while they pay their own way under a type of supervised honor system. The Full Service Jail, which is in the "tower" section of the facility, will house the same types of individuals that the old jail housed. The Adult Justice Center does not have the typical bars that you might associate with a "jail" type environment. Every cell has specially made security windows that will provide a minimum of forty lumens of light to each desk area. The Adult Justice Center is also equipped with specially designed cells to better meet the needs of handicapped individuals. Each cell is designed to house only one inmate. This is important to eliminate coercion within the cell areas and to provide a more secure environment for all officers, staff, and other inmates.